Get to know the bright stars and constellations of each season! A step-by-step introduction to the night sky, the Night Sky Adventure Leader Kit is full of activities and information to help explorers of all ages enjoy the night sky together. "Seeing in the Dark" -- For the best viewing, learn why it's important to let your eyes adjust to the nighttime darkness. "Constellation Detective" -- Can you find well-known constellations under the dark night sky of the Sahara Desert? It's not so easy! With "Sky Heroes," your event participants decide who deserves a place in the night sky. "Making a Family Starfinder" allows everyone to build their own planisphere (star-finding wheel) for easier nighttime "treasure" hunting. With the "Big Dipper Star Clock," you'll always know what time it is at night (if the skies are clear!). "Celestial Treasure Hunt" -- This booklet-style illustrated guided tour comes with each Night Sky Adventure Take-Home kit, and in this activity you help teach your participants how to use it. 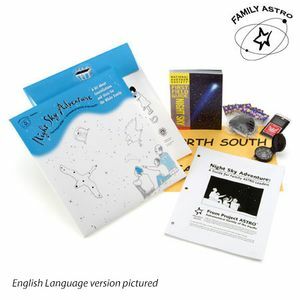 We also feature the Night Sky Adventure kit with an English-version Leader Kit and the corresponding English-version Take-Home kit (see recommended products below). Contents: Leader Guide (includes all event handout masters/training videos), Eye Patches & Sewing Needles (for "Seeing in the Dark"), Cardinal Directions Master, Compass, National Audubon Society First Field Guide: Night Sky and Sample Take-Home Kit (tab enclosed folder with 94 page activity booklet, starfinder-making kit w/ instructions, 2 cookie recipes, erasable placemat, & red balloon to cover flashlight). You may also be interested in purchasing the Take-Home kit, Night Sky Adventure. Other kits in the series include Race to the Planets, Moon Mission, and Cosmic Decoders available as Leader Kits and Take-Home games (see recommended products below). Family ASTRO, a national astronomy education program of the Astronomical Society of the Pacific, helps educators of all types share the excitement of exploring our universe. With funding from the National Science Foundation and the help of astronomers, educators, parents, kids, and game designers, we have put together a number of hands-on activities, thought-provoking discussions, and fun games that let everyone get involved in astronomy. At the heart of Family ASTRO is our series of Leader Kits that allow you to lead many fun and educational Astronomy Events for families, afterschool programs and clubs, and youth groups in your community (e.g, boys' and girls' clubs, Girl and Boy Scouts, park and recreation programs, etc.). Visit More Family ASTRO Games & Kits above.